So you have decided that this is the company for all of your computer needs ...we are waiting to hear from you. Contacting us can at times be a bit difficult. By calling the office number you just may get an answering machine and if so please leave a short message along with your number and we will get back to you. When you do leave a message it would be appreciated if you would speak clearly and slowly and repeat your phone number. If you call the cell number there is a chance that we are with a customer and cannot answer at that very moment so again, just leave a clear message and we will get back to you. Although we are always glad to help you out you must remember that our time is limited thus please do not call us wanting FREE advice on a system or software that you recently purchased at Wal-Mart, Staples, etc. unless you are a regular customer or intend to become one. 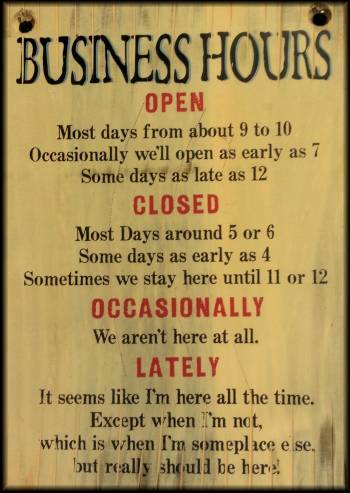 Our hours are varied because many times we have service calls and are out of the office. The picture under our phone numbers and email link is a bit exaggerated but it does somewhat represent our office hours in a humorous manner.